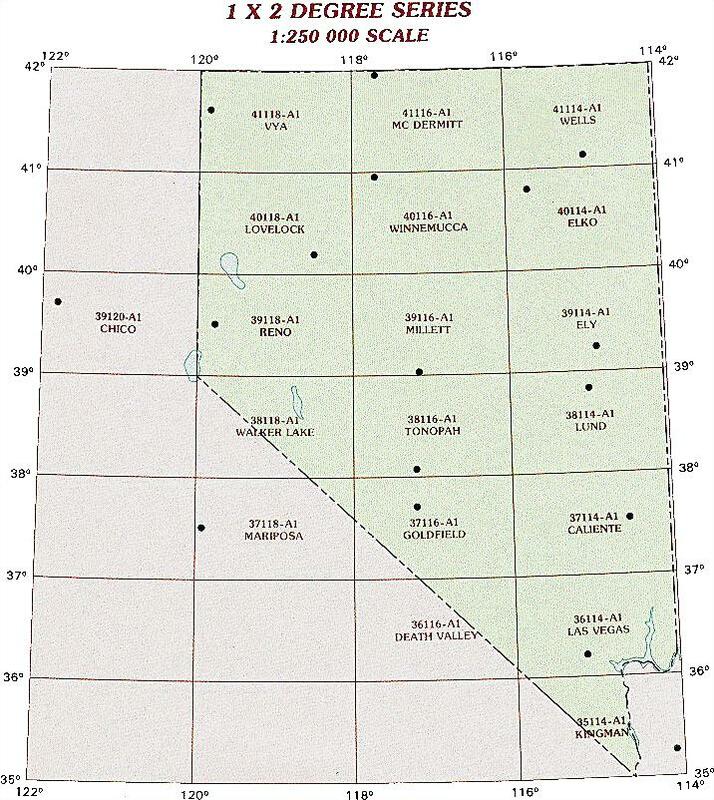 These topographic index maps for Nevada state are provided by the U.S. Geological Survey (USGS) for map sheet identification. 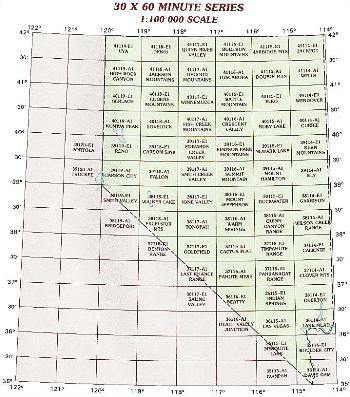 To locate the USGS topo quad in Nevada that you are trying to find, look at the index map of the appropriate map scale. The index map above is for Nevada topo quads at 1:24,000 scale. 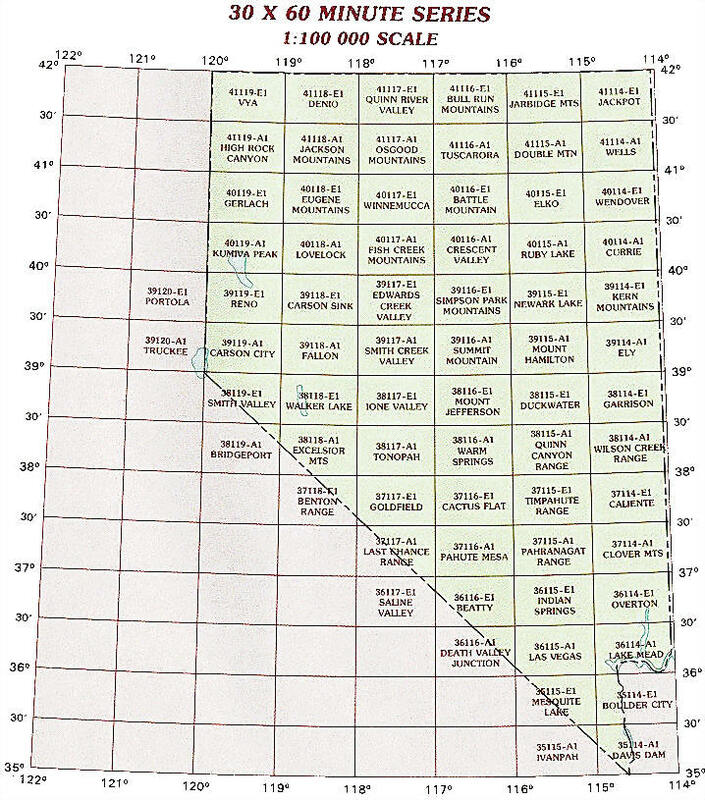 It is zoomable, and you can find the name of the 1:24,000 scale map (sometimes abbreviated as "24k") written diagonally across rectangular boxes that define the borders of the individual 24k map sheets. Note that a rare few of the 1:24,000 scale (aka 7.5 minute) maps in Nevada state might actually be at 1:25,000 scale, which is a very minor difference in map scale. Some of these 1:25,000 scale maps also cover a larger area than regular 7.5 minute maps. Those maps are 7.5´x15´ topo quads, and can be identified on the index map above by a larger sized rectangle that is twice as wide as usual (covers twice the longitude). The map names for these sheets are labelled horizontally, not diagonally. Below you can find the 1:250,000 index map for Nevada state. These topo maps give a general overview of an area and cover a large area: 1° latitude by 2° longitude. A list of all Nevada topo map sheets at 250k follows on the right. Below you can find the 1:100,000 index map for Nevada state. These topo maps give a more detailed overview of an area and cover a medium-sized area: 0.5° latitude by 1° longitude. A list of all Nevada topo map sheets at 100k follows on the right. 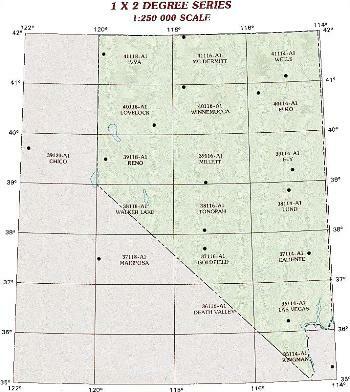 Source of Nevada topographic index map images: U.S. Geological Survey (USGS); supplied by OMNI Resources.